Josie is an American singer-songwriter. She graduated from the Academy of Performing Arts High School and then DePaul University. In 1987, she appeared on the MCA Records release of the Andrew Lloyd Webber original cast recording album Music & Songs from Starlight Express. In 2000, Quincy Jones signed her to his record label Qwest, and released her debut album, Unkunvenshunal Girl. In 2006, the Lady J label released her second album, Where I Am. In 2015, her current record label, Breath of Life, released the single "Elevate" from her third album, Ashes to Beauty. Album available here. Born a star and raised in the “windy city”, Chicago, Illinois, Josie Aiello was destined to shine her light on the world with her exceptional vocal talents. Just two generations removed from her Mediterranean roots in Italy, at the early age of 9 while working at “Cas & Lou’s”, the authentic Sicilian restaurant owned and named in honor of her grandfather and father respectively, her talents were unveiled as she grabbed the microphone and took over the stage singing for patrons and tips. Her angelic voice was undeniable and soon she was being hired to sing for weddings, events and the like. Josie grew in talent and confidence with each opportunity. Her hard work and tenacity paid off when she received a plane ticket to New York city and a recording contract from Grammy award-winning producer, the legendary Phil Ramone. Under his tutelage, Josie was the featured vocalist on Andrew Lloyd Weber’s “Starlight Express” and later recorded a duet with the internationally acclaimed,Placido Domingo. Ramone shared the song with Barbra Streisand, who immediately fell in love with her performance. Eventually, he replaced Josie with Streisand. Down, but not defeated, Josie moved back to Chicago and picked up where she left off. Chicago was listening and taking notice, and so was the world. Josie was in demand as the “go to” session singer for demos, commercials, and songwriters. Trying her hand at the craft, Josie discovered her new talent as a gifted songwriter. Inspired to follow her heart, she packed her bags and bought a ticket to LA, where she would avoid the frustrations of being a recording artist and instead pursue a career as a songwriter. Word quickly spread there was a new singer/songwriter in Hollywood. Josie’s writing skills eventually put her in a writing session with QDIII. Their collaborations were so good, he suggested sharing the songs with his father, the great icon, Quincy Jones. Quincy loved her voice and set up a meeting, where Josie sung for him and was signed on the spot! Her new mentor oversaw production of her first pop CD,“Unkunvenshunal Girl” and introduced her to Warner Chappell, who immediately offered her a publishing deal. She’d made it; she was a professional songwriter, and a recording artist to boot! Calls came in from hit producers Harvey Mason Jr., Kuk Harrell, Laney Stewart, Ashley Ingram; film and TV sessions working with Diane Warren, Marc Shaiman, James Newton Howard, Stephen Bray and many others followed. With enviable success in her grasp, and a bright future in her reach, Josie should have been content, but she was realizing “all that glitters is not gold”; the entertainment industry left her feeling empty and unfulfilled. Praying in desperation to God, Josie began to feel a burning desire to touch hearts and souls with her God-given gifts. In 2004, in answer to her prayer, Josie penned and entered her song “The Call” in the gospel category of the U.S.A Songwriting Competitionwhere she was a finalist. While she didn’t win, she never felt better! She was more in touch with the gifts that poured freely from her heart and soul, than she had ever been before. God was filling her emptiness with songs and melodies that lifted her spirit! The joy of the Lord made her strong and Josie was determined to inspire, encourage and uplift the world! In late 2012, Josie felt a higher calling that she could no longer deny. One night in a Pentecostal church service, Josie was touched by the Holy Spirit and committed her life to Jesus Christ! Things would never be the same. Opportunities that yesterday were attributed to luck or fate today are accounted to the direction and path that God had ordained for Josie’s life. Supernatural things were happening! Josie received an unexpected, unsolicited call from an industry friend, who heard through the grapevine that she wanted to sing for the Lord. That friend was Tony Shepperd; an award winning producer/engineer who had started a new Christian label, Breath of Life Records. After one meeting, Tony offered Josie a recording contract. Connecting with hit makers Tim Stewart, Monte Neuble, Jamie Jones and Jack Kugell, the dream began to come to life. 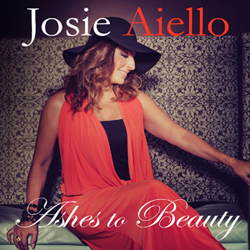 In 2015, Josie released “Elevate”, the first single from her CD “Ashes To Beauty”. Transformed by the love of God and empowered with her gifts, Josie is committed to God’s higher calling for her life. The bible says, “sing unto the Lord a new song”; Josie is doing just that!